dedmen added a comment to T135718: Memory leak on every compiled script. dedmen updated the task description for T137156: [DEV] Forced crash, array index out of range, magazine proxies. dedmen created T137156: [DEV] Forced crash, array index out of range, magazine proxies. On badly written missions and mods yes. And yes fix is underway already. dedmen edited Additional Information on T136172: Wrong soundAttenuationCargo in C_Van_01_fuel_F and others. dedmen updated the task description for T136172: Wrong soundAttenuationCargo in C_Van_01_fuel_F and others. dedmen renamed T136172: Wrong soundAttenuationCargo in C_Van_01_fuel_F and others from Wrong soundAttenuationCargo in C_Van_01_fuel_F` to Wrong soundAttenuationCargo in C_Van_01_fuel_F and others. dedmen created T136172: Wrong soundAttenuationCargo in C_Van_01_fuel_F and others. The "fix" with the new compile syntax is not really a fix. Noone will update their code to that, same as noone (relatively speaking) updated their 5 year old code to parseSimpleArray. Also unless that syntax is used in CfgFunctions every Mission launch that has its own functions still clutters the cache. Not to think about execVM and eventhandlers and addAction and everything else that I can't even think of right now. https://feedback.bistudio.com/T123355 would imply that the caching is done independent of whether you pass code or string. dedmen added a comment to T135846: Certain uniforms seem to mess with the results from getAllHitPointsDamage. dedmen added a comment to T124746: Sound caused FPS drop..
@Groove_C DIfferent issue. This exact bug is confirmed fixed. Confirmed fixed. Please mark this ticket as fixed. @ookexoo Eventhandlers always convert to string and store as string internally. And get compiled before every execution. dedmen updated the task description for T135718: Memory leak on every compiled script. dedmen created T135718: Memory leak on every compiled script. dedmen added a comment to T134662: 1.86 Version of fn_getArea.sqf Breaks Mission. Had 3 cases in Arma discord where this was caused by people supplying wrong arguments to BIS_fnc_randomPos, they all had a "out" parameter in their blacklist. dedmen added a comment to T132812: test_EmptyObjectForBubbles - Suspending not allowed in this context. is the same as execVM. dedmen added a comment to F79242: arma3server_x64_profiling_176_142894_v00_100fps.exe. dedmen added a comment to T84155: IPv6 Support. And it won't happen anymore. Might aswell close this. dedmen added a comment to T120652: Allow Main Menu "Spotlight" feature to join a server. dedmen updated subscribers of T130564: Arma 3 low fps and degrade over time because of sound error, found what it cause (ssAdv). dedmen added a comment to T130564: Arma 3 low fps and degrade over time because of sound error, found what it cause (ssAdv). dedmen added a comment to T128824: Return value for setObjectTexture and setObjectTextureGlobal. dedmen added a comment to T128848: memory leak ARMA3. This is a crash of the Arma Launcher. The different memory allocators you can set for Arma itself don't effect that. dedmen added a comment to T127168: Object Builder viewports acting erratically with Windows 10 Fall Creators Update. Just happened again on 1.80.144071 while playing Liberation mission. It seems like playing that mission makes it most easily reproducible for me. dedmen added a comment to T127895: -skipintro -nosplash not worked on Linux. Not a bug. Startparameters are case sensitive. Which is also why -mod and -world=empty work. They have correct casing. dedmen added a comment to T127851: Bug resolution on linux 1.80.143869. We need some diag command to dump the current content of the sound scene's _globalSounds and get the reason why they are not being terminated. dedmen added a comment to T82940: Deleting non-local object produces RPT spam. dedmen added a comment to T124294: ArmaDebugEngine failure issue. Can be closed. Not a Arma bug. Arma Debug Engine doesn't work with the latest Arma version. dedmen added a comment to T127605: Bad Module Info Crash. Thank you for the report. Could you please upload your Arma 3 report? dedmen added a comment to T82996: Config property 'magazineGroup' has no effect..
Let's hope it turns out good. dedmen added a comment to T127500: Bad Module Info Error - Potential Zeus Correllation. PUBG also has it. So either windows 10 has f'ed up which I find highly likely. Or Battleye, would be the other common element. I also heard that windows 10 lately shows bad module info for any crash. Where it had shown "program has stopped working" before. So the "bad module info" might actually be completly unrelated to the crash behind that. dedmen added a comment to T127565: Default loadout in Arsenal. Can you explain? Deploy which list of units? dedmen added a comment to T127513: Armed ifrits have no glass at all. I'm on Win 8 with automatic updates disabled and the problem appeared without windows updates in between. dedmen added a comment to T127441: Improving the Virtual Arsenal. dedmen added a comment to T127266: Entirely unplayable lag/chugging, issues all over the place. dedmen added a comment to T127268: Playing GrandTheftArma get this crash. Also please upload your RPT file instead of copy-pasting it's contents. You copied all the stuff from the RPT that contains useless information and left out the actually useful stuff because of the length limitation. dedmen added a comment to T127296: Enrich this useless RTP entries. There is no line of code that causes these. Besides the last one and the last one can only possibly be caused by a script. Still mostly caused by engine code. dedmen added a comment to T127314: Still Battleye initialization failed after 1.80 Hotfix. dedmen added a comment to T127315: 0*0000DEAD-. You don't have enough RAM to run Arma. Now that profiling build is out and Arma is somewhat stable. Yeah. Set myself a reminder to do it this evening. ~10 hours from now. dedmen added a comment to T127243: Unknown enum value: "loadCoef". dedmen added a comment to T127059: "serverTime" command reports wrong value until time > 300.
dedmen added a comment to T124317: Small dome structure doesn't cast shadows..
dedmen added a comment to T127214: Preprocessor is lacking correct string handling. dedmen added a comment to T126493: Curve interface. He means the scrollbar is overlaying the mute icon on the right side. dedmen added a comment to T124627: Dev 1.71.141457: Voice commands are audible at extreme distances (2.5km and more). I am running a Mod that disables AI voice commands. But there are still voice sounds played (inaudible but they are in the sound manager) although I am nowhere near to any AI that could do that. And the sounds never seem to properly stop which is why that FPS drop happens. dedmen added a comment to T127101: Game crashes on startup. There are no crash dumps and no logs besides one from 22nd June inside your reports. Can you please try to start your game again and crash it and make a new report. Also try starting it over the A3 Launcher and also try manually starting the arma3.exe in your Arma folder by just double clicking it. dedmen added a comment to T127170: Simple Feature Request for TAC OPS. TacOps is in RC phase and will release in 9 days. They will only fix bugs and add small polish. They won't add any new features. dedmen added a comment to T127084: memory crash as soon as i spawn into multiplayer server. dedmen added a comment to T127066: Can't launch the game (memory issue?). It is your Joysticks software crashing. I guess you have to get in contact with the manufacturer and get it fixed. Maybe there is a newer version already available that doesn't crash. dedmen added a comment to T127078: Arma 3 Crash Shortly After Startup. https://feedback.bistudio.com/T127019 appears to have same dll. dedmen added a comment to T127081: Game randomly exiting. There are sadly no useable crashdumps in your report. Could you please try launching 32Bit Arma? Might very well be in some way related to the Liberation mission. It mosly happened to me on there. Considering the sound bug is a huge flood of unit radio sounds... It might be connected to some sort of AI caching or spawning/despawning. dedmen added a comment to T127083: cant launch the new 64bit. The last time you ran successfully according to your logs you were using -malloc=jemalloc_bi and no -hugePages. dedmen added a comment to T126902: Laser guided Artillery shells. dedmen added a comment to T117794: Special Purpose Helmet - Wrong Heat Signature at weapon optics. Just took about 1.5 years. dedmen added a comment to T127031: arma3_x64.exe - programerror. Could be that your dinput8.dll is infected by a virus. Or running a Antivirus check. Could also be that Battleye is just randomly blocking files. It does that from time to time. In that case it should work of you try again on the next day. dedmen added a comment to T127035: Unable_to_init_dxgi. Try reinstalling your Graphics Card Drivers. Your RHS is throwing a lot of Errors you should talk with the RHS developers about that. dedmen added a comment to T127033: Arma 3 - Game freeze after 20-40 min ingame. dedmen added a comment to T127040: Game crash on Load . Also your "Steps to reproduce" are not correct. According to your logs you are trying to start a mission which then crashes. That is not the same as "Start the game, let it load, it crashes"
It might very well be caused by the Mission or the Server you are playing it on if it is a remote Server. If it's caused by the Mission then the Devs most likely will need that Mission file. dedmen added a comment to T126995: M4 Scorcher turn out. dedmen added a comment to T126982: Detected by Trigger causes RPT spam of a single line "Activation". dedmen added a comment to T127019: Game launch error. Crash in C:\Program Files (x86)\Trust GXT\555\EZFRD64.dll Which seems to be your joystick. dedmen added a comment to T127026: (fixed)game crash when idle after server disconnect (fixed). dedmen added a comment to T127023: Game Launch Crash / STATUS_INVALID_IMAGE_NOT_MZ. dedmen added a comment to T124675: Arsenal info control stay allways visible. Did you try something like SHIFT+Backspace? Same works in Zeus to hide Zeus icon. Maybe it also works here. dedmen added a comment to T126996: Game Crash with windows 8.1 64bit arma3.exe. dedmen added a comment to T126980: Settings get reset after closing and re-opening the game. Go to My Documents\Arma 3 and make sure no file in there is write protected. Maybe try launching Arma as Administrator. 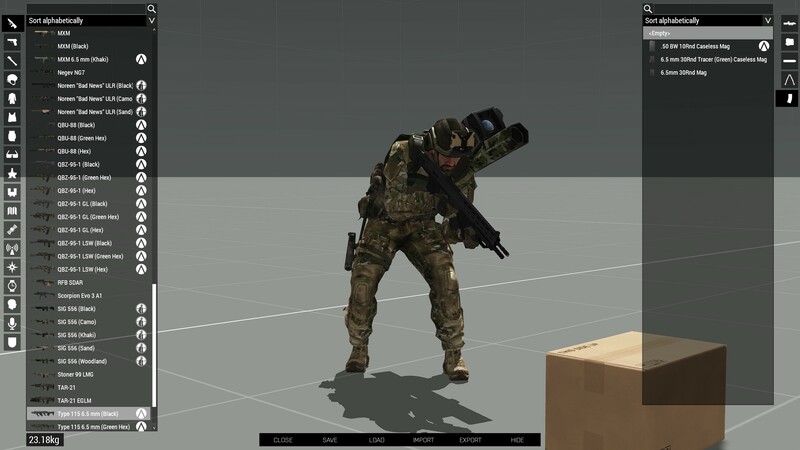 dedmen added a comment to T126999: arma 3 bad image bug. A BIG red exclamation mark at D3DX. You could have found that by yourself. Your DirectX 10/11 is bad. dedmen added a comment to T126972: Visual Glitches. Jup. But reportedly fixed on dev an perf/prof. dedmen added a comment to T126584: Option to remove cheats on server. @MDCCLXXVI There is no eventhandler for any but one cheat. but that's because of the decision to put the groups into the magazines array which wasn't mine. Just tested it. magazineGroup is working just fine in the backend. dedmen added a comment to T126923: Magazine on weapon in Virtual Arsenal UI. dedmen added a comment to T126956: m1 garand . DayZ != Arma 3. No it won't be added to Arma 3.
dedmen added a comment to T126953: Linux server not reading -config=server.cfg. It reads the servername and password from it so.... I'm quite confident it reads the config instead of my mind. I am using -config=serverconfig/server.cfg so it's in a subfolder. No problem here. Can you try if a subfolder works? dedmen added a comment to T121712: Addon a3_characters_f not found. I didn't see anyone mentioning this yet.. A3_Characters_F is listed properly inside CfgPatches. It is there. But it is still shown that it's missing. So the issue is not a missing or corrupt file. dedmen added a comment to T126942: Arma 3.
dedmen added a comment to T126944: Crashing on start up. I don't see any Game crashes in here. It's the Launcher that crashes. dedmen added a comment to T126905: Memory Write Error On Start - Status Access Violation Crash. Crashed somewhere inside graphics component. Only the devs can tell you more specifics. Did you try completly redownloading CUP yet? There was also a CUP update recently. Good time to redownload everything now. Might be a corrupted model or texture. dedmen added a comment to T126925: PIP in ultrawide resolutions. If it happens to Car mirrors too it's not caused by ACE. Don't see this being an ACE problem but screenshots would still be awesome. dedmen added a comment to T126891: error launching the game arm 3 through launcher. That report is mostly useless. The RPT is missing for the only crash report in there. And for the other RPT's there are no crash reports. Can you create a new one? Please create the Report after your game crashed. And not after you successfully started your game twice. dedmen added a comment to T82702: [1.46.131101 RC] Chat log disappears.